Here are the top seven reasons why my blog is called “Toss the Typewriter”. 7) Did I mention, I’m a writer? 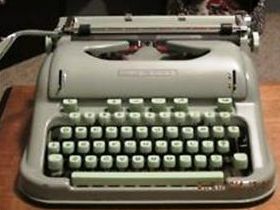 6) In college, in the olden days, a couple of centuries ago, I actually had a typewriter. It was pretty fancy: electric with a ribbon that I could manually rewind when the words started fading. I had perpetually ink-stained fingertips. I typed for beer. Yup, that’s right. A five-page paper was worth a six-pack of Molson Golden. Entrepreneurship at its best (if you like Molson Golden). Then computers came along, followed by PCs, and I was out of business. Probably a good thing, or I might still be typing other people’s words for a six-pack. 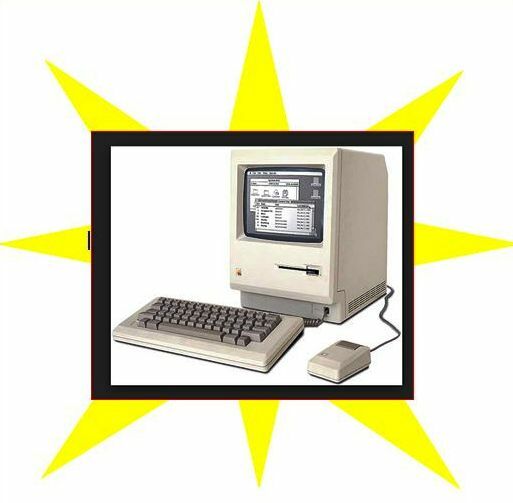 I was pleased to toss the typewriter and buy my first Mac. 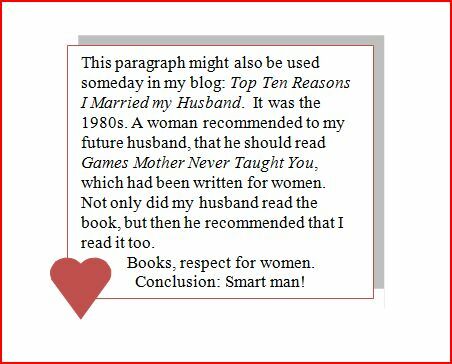 5) “Don’t let then know you can type,” recommended the 1977 version of Games Mother Never Taught You: Corporate Gamesmanship for Women, by Betty Lehan Harragan (page 318). The typewriter was a pariah to be hidden away because of its “enduring immediate association with secretarial duties.” I followed a lot of advice found in this book, but luckily I missed this recommendation. With a BS in Recreation Management, I typed my way from promotion to promotion, and infiltrated the world of computer programming. I credit my relationship with the QWERTY keyboard for helping me advance. 4) Typing class…8:45 AM…cold, winter mornings…fingers frozen from forgotten gloves…black keys stiffly awaiting the first punch…Sister Dismas watching every keystroke…no coffee addiction…yet. Need I say more? 3) It would be awesome to stand on the top floor of a tall building, preferably eight or more stories, open the window, and let fly the typewriter that didn’t cooperate in writing my first novel (hence the technology career). Ah, the beauty of this machine tumbling end-to-end until its heavy side finally finds gravity. I watch metal hit concrete shattering the typewriter into 26-plus perfect pieces. Then I skip down the stairs and into bright sunshine to admire the chaos. And there it is, the perfect sentence written out by typewriter keys embedded in sidewalk. I would never do this; but I can dream. 2) These days, instead of trying to toss a 20 pound, expensive piece of equipment, we can toss a one-pound, $12 keyboard. We’ve come so far. But where’s the satisfaction? Fordn’y rbrty etiyrt hsbr yhodr fsyd ehrn yhr ginhrtd str midslinhrf snf s eholr pstshtsph lookd likr yhid? Doesn’t every writer have those days when the fingers are misaligned and a whole paragraph looks like this? Obviously it’s the typewriter’s fault! This entry was posted in FYI for Regular Visitors, Reading and Writing, Weekly Brief and tagged Betty Lehan Harragan, Blog Tips, humor, Molson Golden, Reading and Writing, Typewriter. Bookmark the permalink.